Description: Operating down the Pittsburg Sub. was KCS Train C-KCWE 15 with 2 UP Locomotives and 2 KCS Southern Belle SD70ACe's. This was my first look at a "Retro Belle", and they're quite a sight, even under clouds. Description: These are some sharp looking locomotives. Too bad they weren't leading. I'll have plenty of chances to see them in the coming months. 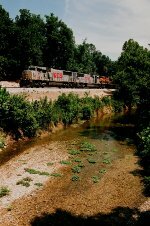 Description: A pair of Retro Belle SD70ACe's lead a northbound grain train up KCS's Heavener Sub. Description: Pair of Belles, plus other power, bring a train northbound into Heavener near MP340 (Petross community). Description: A Gray AC and a Southern Belle ACe were parked in the siding waiting on a new crew. A Belle Hop with 2 Southern Belle ACe's rounded the curve just after I left. Figures. Description: A yard crew from the UP has just boarded this train at I-10 in New Orleans and will take it over the Huey P. Long Bridge. Description: KCS Southbound Grain Train passing through Petros, Ok. Author: William H. Davis Jr. Description: NLKC rolls north along the creek just after clearing North Dorsey. Description: The Q NLKC reaches the top of the grade from Anderson as it approaches the crossing in Goodman. Description: The NLKC rolls past the old Noel station, now serving as city hall here. Description: BNSF Southbound freight with KCS power and BNSF GP60B unit no #.